I was born in Iowa, am 85 years old, a retired mechanical engineer, and have been riding for about 40 years. I usually ride alone, but always my destination involves meeting and camping with other bikers. I wanted a motorcycle ever since I was about three years old and heard a motorcycle coming down the street. I watched it go by and knew that someday I would have one. Circumstances dictated that was not to be for many years. When I was in the South Pacific during World War II, I built a motor-scooter, using bomb carrier wheels and a Briggs and Stratton single cylinder engine. No brakes, so stopping was always exciting. Many years later I got my first bike, a Honda 450. My two sons also had bikes at the time, and we three, with our wives, would take day trips around the Seattle area. Now I am the only family member still riding. The longest trip my wife and I took was essentially a Four-Corners ride, tranversing most of the United States. We were gone seven weeks and covered over 10,000 miles. When my younger son won a Harley in a contest, he let me ride it once. That convinced me to sell my bike and get a Harley. That was about 20 years ago and I've been riding Harleys ever since. I had a sidecar on one of those Harleys but it wasn't a Liberty sidecar and I didn't change the triple-trees, so it wasn't fun to ride. 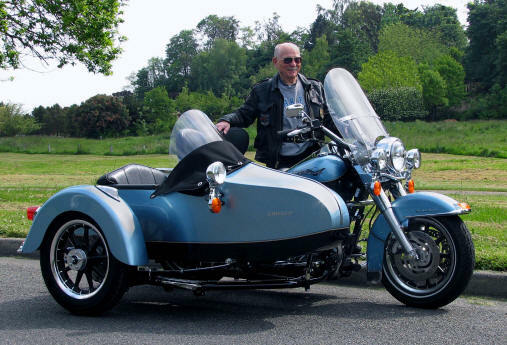 I recently had a Liberty sidecar mounted on my 2007 Harley Road King, and it is a great ride. It draws attention wherever I go, and gets "thumbs up" from everyone who sees it. For me, it's the only way to go.